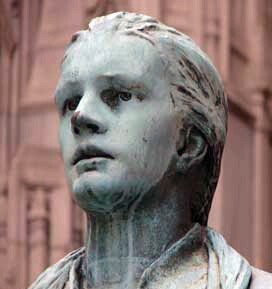 Nathan Hale (1755-1776) was perhaps the American Revolution’s best known martyr. Born in Coventry, Connecticut, Hale graduated from Yale shortly after his 18th birthday. He worked as a schoolteacher in rural Connecticut until volunteering for the Continental Army in 1775. Hale received a lieutenant’s commission, participated in the siege of Boston and was promoted to the rank of captain. Following the battle of Long Island in August 1776, Hale went undercover behind British lines to gather information. There he was spotted and identified to the British, either by a British officer or an American Loyalist. Hale was arrested and summarily sentenced to death, without trial or court-martial. According to reports, his final words on the scaffold were “I only regret that I have but one life to lose for my country”. 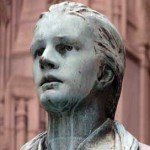 Hale’s execution without trial and his final words served as a moral inspiration for the Continental Army. They have also been integrated into popular narratives of the revolution.